There are two kinds of properties that we deal with every moment of our lives. There are those things we can control to varying degrees of influence. These are manageable properties. Examples of manageable properties are our reactions to our situation, our attitude, our choices to pursue an action, and most importantly, our attention. And, there are those things we do not have complete influence over in our lives. These are emergent properties. 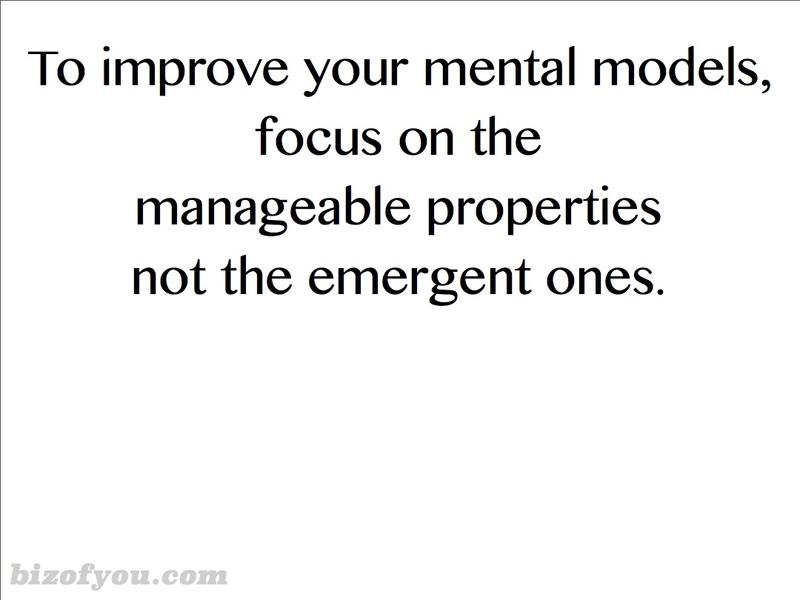 Emergent properties include our happiness, success, failure, life satisfaction, joy and meaning where our state of mind and attitude are just one of many inputs. These two classifications of properties are extremely important relative to managing the business of ourselves. It is imperative to know those things we can influence and those that we can’t. Society, organizations, parents and peers lead us to think many things are in our control when in fact they are not. Marketing pushes that we are in control of our happiness as it helps for profit companies sell their product to us for the simple reason; pleasure is profitable. It is important to come to terms with the fact that most of what we perceive is an illusion emanating from the models we have continually created in our minds through the years. Often these models are passed down through the generations in our families and social structures of which we partake. It takes time to slowly reroute the flow of our thoughts to clarify our models of reality so that they more accurately reflect the life around us. We must be patient and practice self-control to affect our habitual thinking which over time slowly alters the models we live within. This rerouting of our thoughts also includes placing value not on the emergent properties outside of our control but upon the manageable ones. In doing so, we set up the conditions by which the emergent properties we want and even crave emerge more readily. As an example, we are conditioned through marketing, the books we read, the television we watch and the movies we get into that human proportions are those with washboard or six-pack stomachs, muscles we can see through our skin and skins with no blemishes. We grow up with images of the ideal person. When we find ourselves in adulthood, our self-image doesn’t match our mental model. Or if we are lucky when we are young adults we have some elements of the ideal body, but when we age, things begin to move, change and alter in ways that don’t meet our mental models. We can suffer the different or we can accept who and what we have become. We can slowly reroute our thought throw positive affirmations and letting go of our mental models of emergent properties we have no control over. We can change how we perceive the world if we simply focus on the things we can change in lieu of the things we have no control over. ← What’s your Mental Model?